Few things in life are more frustrating than not being able to access the internet when you have a lot of work (or play) to do. When your computer can't connect to the network, you may see an error message that reads "A network cable is unplugged "and see a red "X" on the taskbar or in Windows Explorer. This message might be seen only once every few days or once every few minutes depending on the nature of the problem, and it can occur even when you're on Wi-Fi. Errors regarding unplugged network cables have several potential causes. Typically, the message appears on a computer when an installed Ethernet network adapter is attempting unsuccessfully to make a local network connection. Reasons for failure might include malfunctioning network adapters, bad Ethernet cables, or misbehaving network device drivers. Some users who have upgraded from older versions of Windows to Windows 10 have also reported this issue. Restart the computer by fully powering down, waiting a few seconds, and then turning the computer back on. If you're on a laptop, take the extra step of removing the battery, if possible, and walking away for 10 minutes. Just unplug the laptop from power and remove the battery. When you get back, reattach the battery, plug the laptop back in, and start Windows again. Disable the Ethernet network adapter if you are not using it. This applies, for example, when running a Wi-Fi network with computers that have built-in Ethernet adapters. To disable the adapter, double-click the small "A network cable is unplugged." error window and choose the Disable option. Check both ends of the Ethernet cable to ensure that they are not loose. One end is connected to your computer, and the other is connected to the main network device, probably a router. If this doesn't help, try testing for a faulty cable. Instead of buying a new one outright, plug the same cable into a different computer or temporarily swap out the Ethernet cable for a known good one. Update the network adapter driver software to a newer version if one is available. If it's already running the latest version, consider uninstalling and reinstalling the driver or rolling the driver back to a previous version. It might seem impossible to check the internet for outdated network drivers when the network can't reach the internet. However, some free driver updater tools such as Driver Talent for Network Card and DriverIdentifier can do just that. Use Device Manager or Network and Sharing Center (via Control Panel) to change the Ethernet adapter's Duplex settings to use a "Half Duplex" or "Full Duplex" option instead of the default Auto selection. This change can work around the technical limitations of the adapter by changing the speed and timing at which it operates. Some users have reported having more success with the Half Duplex option, but note that this setting lowers the maximum total data rate that the device can support. To get to this setting for your network adapter, go to the device's properties and find the Speed & Duplex setting within the Advanced tab. On some older computers, the Ethernet adapter is a removable USB dongle, PCMCIA, or PCI Ethernet card. Remove and reinsert the adapter hardware to verify that it's connected properly. If that doesn't help, try replacing the adapter, if possible. 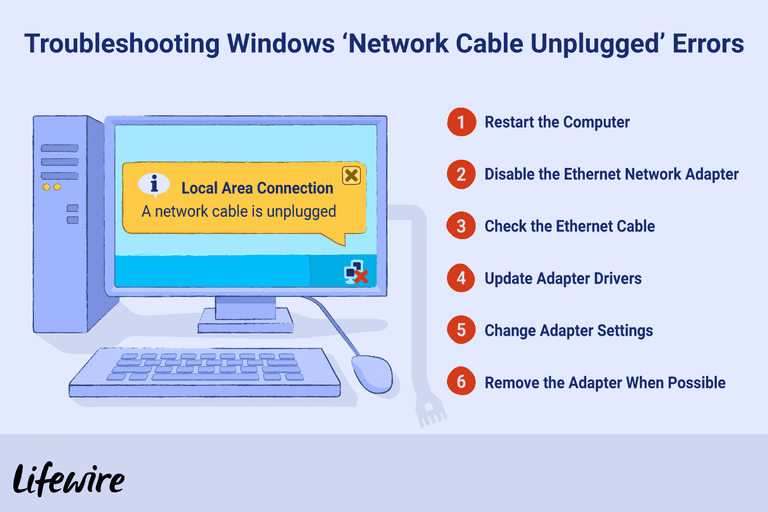 If none of the above procedures fix the "A network cable is unplugged" error, it's possible that the device on the other end of the Ethernet connection, such as a broadband router, is the one malfunctioning. Troubleshoot these devices as needed.